Here's a detailed explanation of what a W-2 looks like. When you earn wages or a salary from an employer, you’ll receive a W-2 form by Jan. 31 of the following year, which contains all the relevant information about your income that you’ll need for tax preparation purposes. Your employer will also send a copy to the Social Security Administration, which will match the information from your employer with the information you report on your tax return. In case you had more than one employer during the year, you’ll need to wait to receive all your W-2 forms before filing taxes for the year. Here’s a guide to everything you need to know about a W-2 form. Technically, a W-2 form is known as a Wage and Tax Statement. In addition to listing how much you earned and paid in taxes, it includes personal identifying information, such as your Social Security number and information about your employer, including its Employer Identification Number. Each section of a W-2 serves a specified tax-filing purpose. The IRS provides extensive instructions that are updated annually for the more complicated entries on the form. What’s on a W-2 Form? 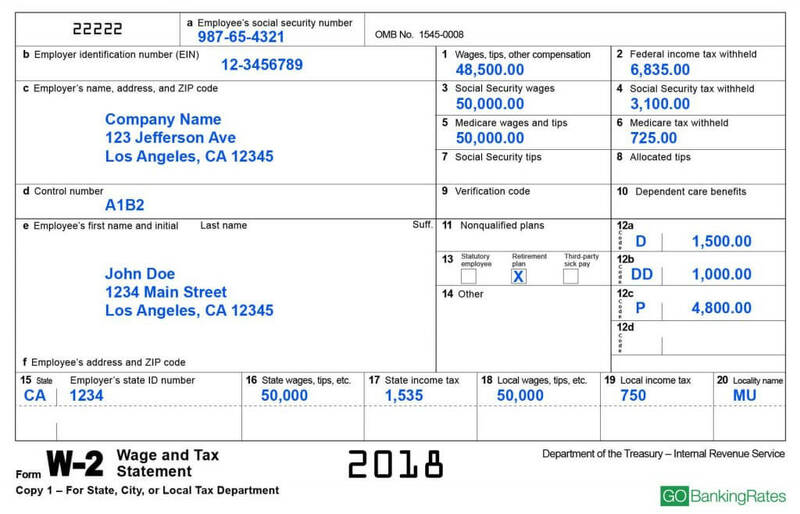 A W-2 is broken down into numbered and lettered boxes. Here’s a breakdown of each of the boxes you’ll see when you receive a W-2 form. Some are self-explanatory, and others need descriptions. Follow along with the diagram to see what each of the numbered and lettered fields means. 13) Check boxes: Your employer will check if any of the following apply: statutory employee, retirement plan or third-party sick pay. A statutory employee is an independent contractor who is treated by statute as an employee. Retirement plan is checked if you participated in a retirement plan through your employer. Third-party sick pay is checked if your employer is reporting sick pay received from a third party. When Will I Get My W-2 Form? Find Out: What If I Lost My W-2? Who Does and Doesn’t Get a W-2? “Income, Social Security or Medicare tax was withheld. In essence, most traditional employees who receive a paycheck also receive a W-2. Freelance workers and independent contractors generally receive a Form 1099-MISC instead. Learn the purpose of a W-9 form and how to fill one out.